Alright, we are officially in FALL!!!!!! I know, I know…it may be 90 degrees on the East Coast, in the 80s here on the West Coast but still, there is a certain something in the air. Nights are cooler, leaves are changing colors and that means pumpkins and hot chocolate are in order. While I bake all year long, there is something special about baking in the fall, it comes so naturally. The smell of cinnamon and sugar, visits to pumpkin patches and apple orchards, I don’t think there is anything better. 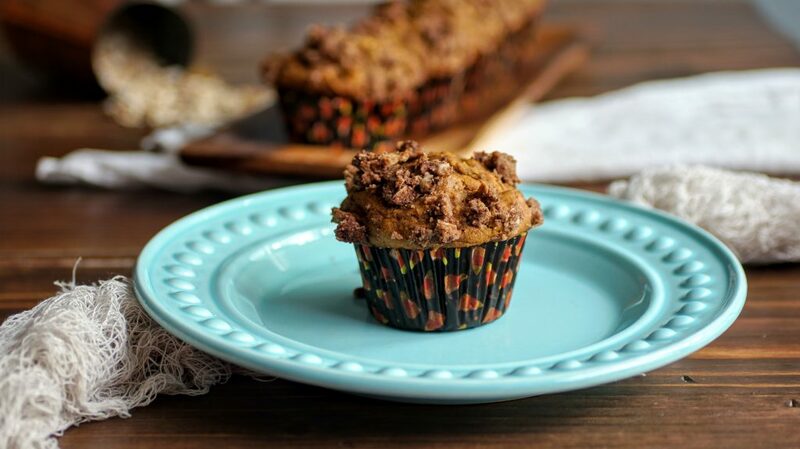 Naturally, the first fall recipe on the blog must be pumpkin. Truth be told, pumpkin all on its own, I’m not the biggest fan. But pumpkin baked goods are true perfection. I think all the spices: cinnamon, nutmeg, ginger + cloves turn that subtle pumpkin flavor into something magical. But what makes any muffin the pièce de résistance? Streusel. Streusel: bits of flour + sugar + butter baked to achieve the utmost deliciousness. It takes any cake or cupcake from good to fantastic, from a healthy snack to your 3:00 afternoon coffee treat. 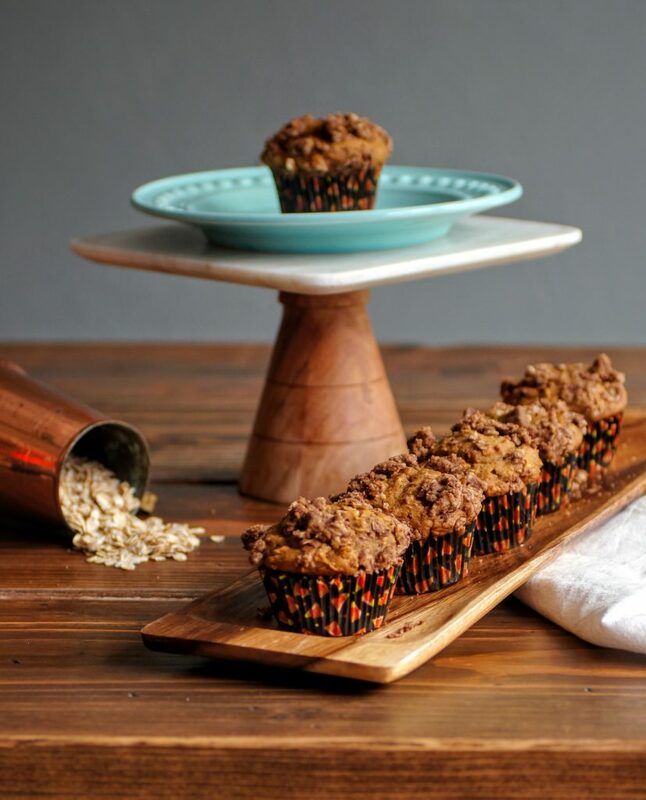 I think these muffins not only make a perfect coffee treat, but a wonderful breakfast for your loved ones. Packed with pumpkin, oats, coconut oil, yogurt and honey, they really are quite a perfect light breakfast. One of the biggest debates when it comes to pumpkin baking season: canned pumpkin vs fresh pumpkin. I LOVE making everything I possibly can from scratch: pizza dough, tomato sauce, cheese, yogurt, you name it and I love the homemade version. However, when it comes to pumpkin, I have tried fresh (which has its place) but through and through I prefer canned pumpkin for baked goods. The problem with fresh sugar pumpkin is the liquid. There is much more liquid when you cook down fresh pumpkin which completely effects a recipe (and not for the better). So in my personal (non-professional) opinion, I go canned all the way! And frankly, picking up a can of pumpkin is a heck of a lot easier when you’re looking to make a quick breakfast. My go-to canned pumpkin is Trader Joe’s Organic Canned Pumpkin. It has a great flavor, inexpensive and who doesn’t love Trader Joe’s?? If you’re not fortunate to be close to a Trader Joe’s, Libby’s is tried and true or any other preferred brand. I hope you find these little gems as special as my family has. They would be a perfect snack on your pumpkin patch or apple picking adventure or just at your table this weekend. As always, I’d love to see your creations! Tag me on Instagram @CosettesKitchen or post on my Facebook Page. Preheat oven to 400 degrees and line muffin tins with cupcake liners (or spray with cooking spray). Begin by mixing your dry ingredients in a large bowl, whisk to incorporate and set aside. In another bowl, add your pumpkin then eggs and whisk. Next melt your coconut oil FIRST, pour into pumpkin mixture and whisk then pour your honey into the same vessel as you used for the oil. The honey will slide right out into the pumpkin mixture. Finally add yogurt and vanilla and whisk until smooth. Pour wet ingredients into dry and fold gently until fully incorporated and no white shows. In another small bowl, create your streusel. Mix ingredients together until incorporated and crumbly. 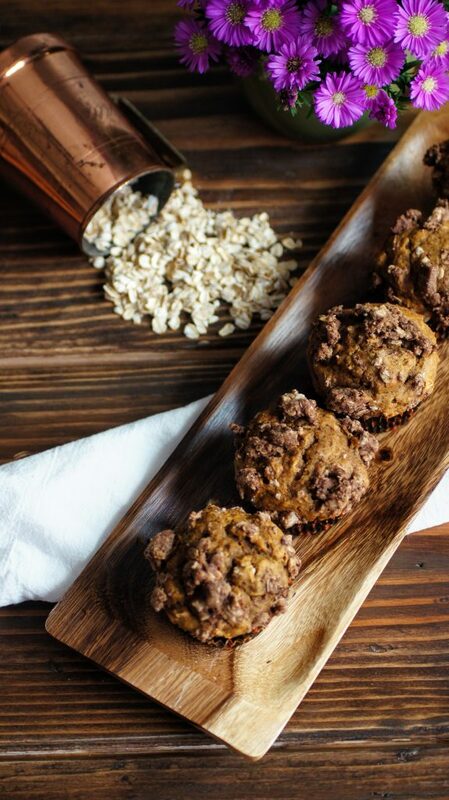 Using a scoop or large tablespoon, fill muffin tins fully to the top. Crumble some of the streusel on top of each muffin. Bake muffins in upper middle rack for 5 minutes at 400 degrees, then lower temperature to 350 and bake for an additional 15 minutes. Check for doneness and remove from oven, allow to cool and enjoy! **Mix-ins would be a great addition: pecans or walnuts! **You can certainly use butter in place of coconut oil in the streusel ~ although the coconut oil works really well! **I imagine you can bake in a loaf pan, it would probably take about 45-60 minutes. Cover streusel to ensure it doesn't burn.